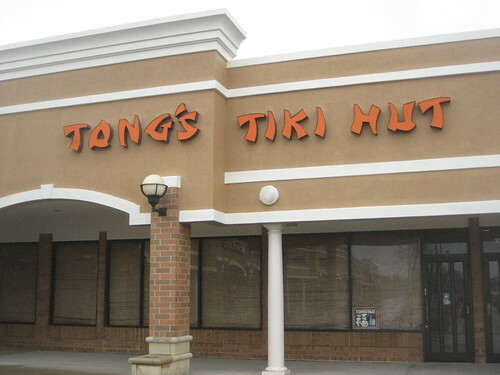 When you first pull in to this strip mall in the western suburbs of Chicago and see the covered up windows of Tong’s Tiki Hut, you might mistake the Villa Park restaurant for being closed. In fact, the bamboo blinds obscuring the windows help to accomplish what most tiki bars aspire to do, which is create an insulated tropical environment with no distractions from the outside world. 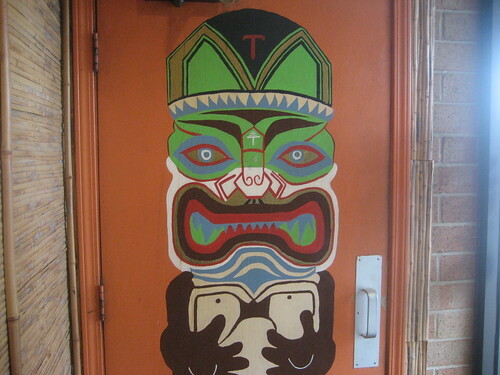 For being a neighborhood Chinese restaurant, their dedication to the tiki theme is impressive. (They even got the music right with recordings of soothing Hawaiian steel guitar.) 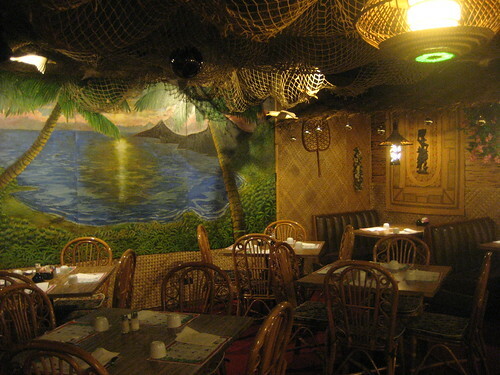 There’s a beach mural and lauhala matting on the walls, and a thatch overhang above the brown vinyl booths. Bamboo, shell and tapa pendant lamps are suspended from the ceiling, which is covered with fish netting and entangled plastic seagulls, lobsters and crabs. 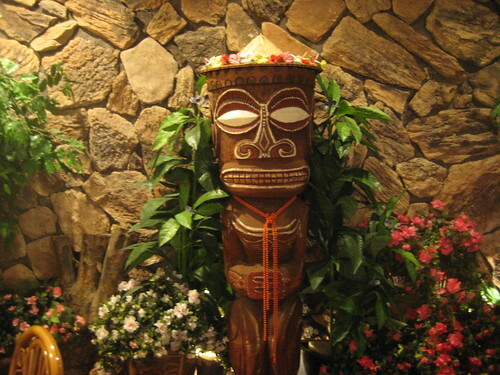 A vaguely Rarotongan looking tiki stands against the rock wall, and to its right is a leopard-print bar flanked by an odd, colorfully-painted tiki pole. 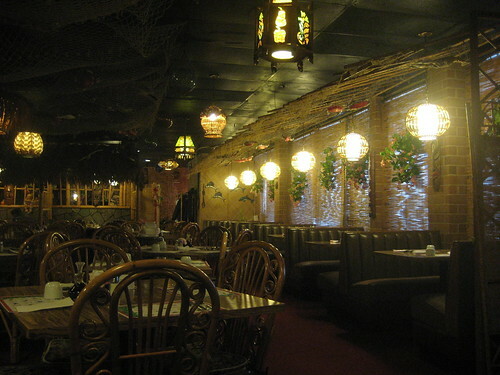 Beyond that is another smaller dining room with more rattan furniture and another island mural (last picture). 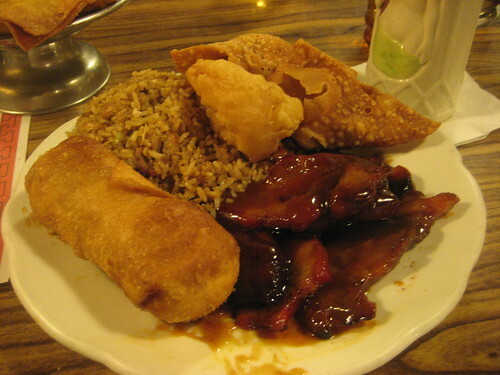 Their version of the pupu platter is called a bo bo tray ($11.95), which includes two each of egg rolls, barbecue ribs, aloha fried shrimp, Polynesian beef and wontons surrounding a small cooking sterno. 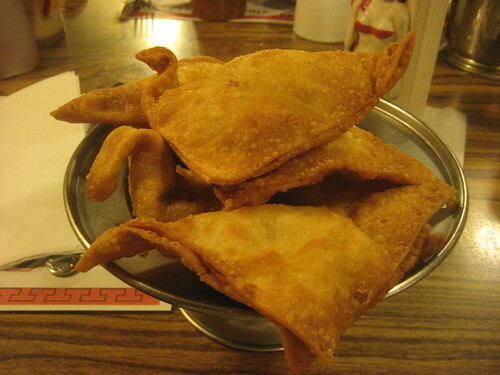 I, however, went for my favorite “Polynesian” appetizer, crab rangoon (6 pieces for $5.95), and it was one of the better renditions of the dish I’ve had, with lots of filling. Less pleasing was the barbecue pork combination plate ($6.50), one of several weekday lunch specials that come with pork fried rice, flavorless wontons and an obscenely large egg roll (plus a cup of soup, fortune and almond cookies, and tea). 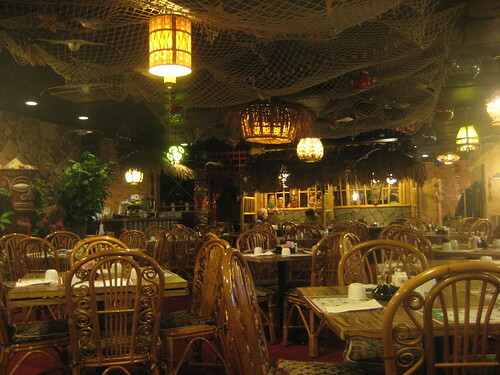 If we’re comparing tiki-themed Chinese restaurants in the Chicago suburbs I’d say that Chef Shangri-la in North Riverside has better food and drinks overall, but I was charmed by the decor and cozy vibe of Tong’s Tiki Hut. 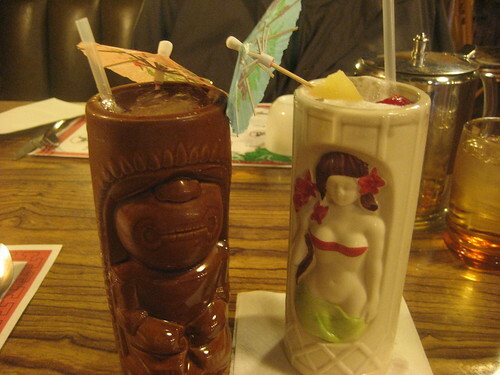 Nice find, Tiki Chick. 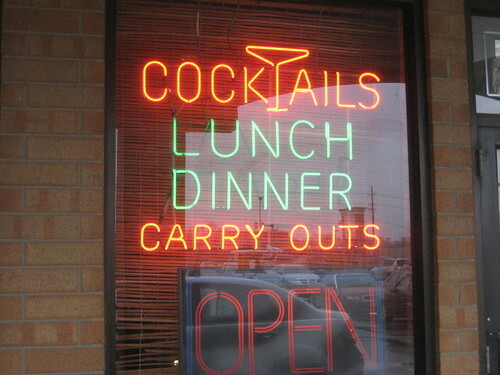 Those drink prices are amazing! Hour hour prices or always that low? Always that price! I could barely believe it myself. 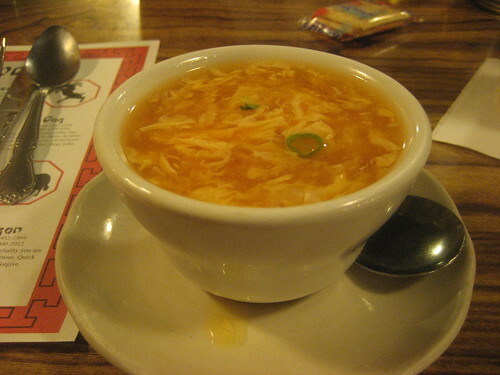 It’s a great neighborhood spot! I really need to make it out there again soon.